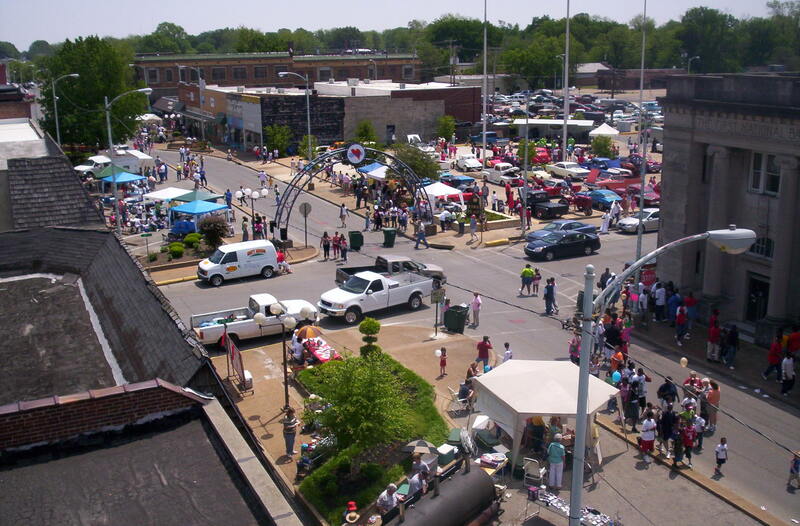 Annual Heritage Celebration on Blytheville, Arkansas' Historic Main Street. Blytheville (population 18,272), one of Mississippi County’s two county seats, was founded in 1879 by Methodist circuit rider Henry T. Blythe. Mississippi County had thousands of acres of cypress and hardwood trees, and timbering was the community’s first principal industry. After the woodlands were decimated, residents turned to agriculture, and Blytheville was well known for hosting the National Cotton Picking Contest each year. With the advent of mechanization came significant cuts in the number of farm workers, many of whom left for jobs in the cities. In recent years, new industries have come to the area, and the Arkansas Aeroplex at former Eaker Air Force Base is the second largest industrial complex in the state. Blytheville is located along the Great River Road National Scenic Byway, which incorporates riverside roads in five of the ten states that border the Mississippi. A new tourist information center is planned in Blytheville’s historic Greyhound Bus Station (1938), which recently was awarded Federal Transportation Enhancement funds to assist in the proposed rehabilitation. The City is also poised to upgrade the Blytheville Heritage Museum, which is located in the historic Kress Building (1938). A ¼ cent local sales tax goes directly toward improvements at the museum. Blytheville has also become a focus for archeological study in northeastern Arkansas through development of a new Arkansas Archeological Survey Research Station at the former Eaker Air Force Base. The Station has worked closely with the Blytheville Public Schools in developing an archeology program for fifth and sixth grade students.